This is the story of how 18th century London tried to keep its streets clean and its houses fragrant. I came across the newspaper reports when researching Swaledale dairy farmers - it is astonishing where the internet will take you - and I thought 'I didn't know that!'. There were also some reports which made this normally clean-living grandmother think 'I wish I hadn't know that' but I kept going. It was getting too good to miss. Until now, my research has been about Swaledale in the 19thC, and I have written a series of essays investigating the decrease in the dale's population. I then started tracking down the cowkeepers who moved from the Yorkshire Dales to supply milk to Liverpool households, towards the end of the 1900s. But I wanted to go further back and, since the only online newspaper hits for 17th and 18th century cowkeepers were in London, I had to switch my attention south. And what a filthy place London was - as you can see from this painting by Carle Vernet of an enterprising street sweeper and his wheeled plank. Some London cowkeepers had carts for shifting muck, so I set off to find out how bad the muck problem was. I searched the internet for 'sewer' and the fascinating results are here. Cowkeepers will have their own separate essay; this one is about sewers. Monopolies were systematically being broken. In the mid 1500s Henry VIII had broken the monopoly of the Catholic church by declaring himself Head of the Church in England, and taking over the church's land-holdings (including the roads). In the mid 1600s Cromwell had broken the monopoly of the monarchy by installing an effective parliament (and beheading the monarch). In 1695 the monopoly of the Stationers' Company on print licences had been broken by Parliament and the freedom of the press had arrived. The combination of these events made this essay possible. I have two stories to tell. On this page I describe the efforts made by 17thC monarchs and councillors to keep London's streets clean. On the next I tell the story of the Pall Mall sewer as it unfolded in the daily newspapers of 1729. I promise that I have not made anything up. There is a vast amount of detail to be found on various websites but to keep this essay focussed I have put links to the ones I found interesting, and given a bibliography at the end. I have also given my source for key facts [like this]. Cities have always had sewers. The Romans and the Assyrians had public sewers - they probably even had cowkeepers - but I didn't want to go so far back. This story can start in the 1530s with Henry VIII's acquisition of monastic lands, which included control of the roads that went across them. To improve their condition he imposed a tax on roadside properties to pay for surface water to be drained away, presumably into the nearest stream. Deliberate pollution of the water supply was bad news if you lived down-stream - and in 1579 one London street had sixty houses sharing three latrines - so Henry also made some attempt to create a separate public water supply. The continuing supply of fresh water to London happened haphazardly, but that story is well told elsewhere. Joined-up drainage and sewerage for London was the work of Bazalgette in the 1850s and his excellent over-engineering, typical of the Victorians, meant that the system has lasted largely unchanged until now. His Metropolitan Main Drainage Works, carrying 60 million gallons a day, were well described in the 1860s by S J Mackie in an article in the Popular Science Review. Unfortunately at March 2012 the website link has disappeared and I cannot find a new one. This example of Bazalgette's work is from the BBC's Seven Wonders website. The Westbourne starts between Kilburn and the west side of Hampstead Heath, passes west of Paddington and through Hyde Park, where it was dammed to form the Serpentine boating lake. From there it flows under Knightsbridge, crosses over the platforms of Sloane Square underground station in a steel tube, then round the Royal Hospital to the Thames. The Tyburn drains the middle part of the city, starting again at Hampstead Heath then south through Belsize Park and St John's Wood to Regent's Park, where it feeds the lakes. Marylebone Lane was originally the path of the Tyburn before it was culverted and if you look at a modern street map you can still see the river's winding route as it crosses the grid of Georgian streets in the West End. The Tyburn then goes across Oxford Street, Mayfair, Grosvenor and Berkeley Squares, Green Park, then across the front of Buckingham Palace. The final route is unclear (but I found evidence that at least part of it went through St James' Park, across Whitehall and out to the Thames at Scotland Yard - see below) and the general collection of underground channels is known as the King's Scholar's Pond Sewer. The King's Scholars were the first forty pupils of Westminster School, originally the choir school for the Abbey. Why they should have a sewer named after them is a mystery, although the final newspaper cutting in the Pall Mall essay gives a possible reason. Hampstead Heath ponds are the source of the Fleet, which flows south-easterly past Kentish Town, Camden Town and King's Cross, past the Mount Pleasant sorting office then Farringdon Street and Ludgate Circus, and on to the Thames (more later). From at least Henry VIII's time, all English parishes or boroughs had appointed a person to be responsible for keeping the streets clean: he was called the Scavenger. In the 1630s the north end of the Haymarket led to open fields, one of which was Scavenger's Close. In small country parishes the scavenger did the street-sweeping and muck-shifting himself, and often combined the work with bell-ringing or acting as constable. For example, in 1621 the Scavenger of Wisbech was also the Beadle, and was paid 12d per week. In 1685, the Scavenger of Newcastle-under-Lyme was authorised to collect 4d from any householder who did not clean and clear the street in front of his house. In 1690 the Treasury accounts show a payment of £19 10s to Joseph Buckmaster, one of the many workers involved in what seems to have been an extension to the Royal Mint (though this seems a lot; maybe it was to dissuade him from sampling the product). Whatever a Scavenger found was his to keep, or sell. In Worthing (1818), the job was openly auctioned to the highest bidder, so local pickings must have been valuable! "the mud, when rak'd up, be not left in heaps to be spread abroad again by the wheels of carriages and trampling of horses, but that the scavengers be provided with bodies of carts, not plac'd high upon wheels, but low upon sliders, with lattice bottoms, which, being cover'd with straw, will retain the mud thrown into them, and permit the water to drain from it, whereby it will become much lighter, water making the greatest part of its weight; these bodies of carts to be plac'd at convenient distances, and the mud brought to them in wheelbarrows; they remaining where plac'd till the mud is drain'd, and then horses brought to draw them away." But, he says, nothing came of the idea. My 1847 Walker's dictionary defines the Scavenger as 'a petty magistrate responsible for keeping the streets clean' so the job had gained respectability, and responsibility, as the years went by and the need increased. The cost of street cleaning was part of the rates and calculated locally, along with the poor rate. In London, the Borough Scavenger was responsible for collecting the rate from the householders and traders, as assessed within each Ward, and for licensing, monitoring, and paying the street cleaners (car-men), and he had to present regular accounts to his local JPs. The carmen were very much like our modern dustbin-men - they regularly carried away household and trade rubbish, unless it was snowing (it is snowing as I write this) in which case their priority was to clear the streets of snow. In the 1600s, London was a comparatively small place. Familiar names like Chelsea and Camden were villages off the map and what would become Regent's Park was an open cesspit. There was only one bridge across the Thames, though there was a horse ferry from Westminster to Lambeth. But the city had just suffered a major catastrophe: the Great Fire of London in 1666 took out 440 acres - 80% - of the city. Charles II, and the City of London, were busy rebuilding. The Fire had cleaned out many of the areas affected by the Plague of 1665. It also allowed for re-building regulations to be introduced which not only minimised the risk of fire, but also the risk of a drenching by rainwater from spouting gutters or by chamber-pot contents flung out of upstairs windows. The 1667 legislation insisted that new buildings replaced spouting gutters with downpipes to carry rainwater to a surface ditch or below-ground drain [Cockayne]. Here is James de la Feuille's 1690 map [British History Online] superimposed with the boundary of the fire. The Tower of London is at the right-hand edge of the fire, and Westminster is the pointy bit at the left of the map. So 17thC London was small, but it still had a population of 400,000 in 1650, and 575,000 in 1700 [Boulton], and no en suite bathrooms. Rivers and streams running into the Thames were the route for a series of what were called common sewers. Any water running in the direction of the river Thames became the obvious place to throw rubbish and slops that would otherwise have lain stinking in the street. From what I have been able to discover, it seems that a system evolved during the 17thC where what we would call main roads had sewers underneath them, and each side street had a central open channel that eventually drained into one of these sewers. The volume of rainwater available would determine how quickly the rubbish was carried away. A flow rate of 2 feet per second will move solids along a sewer, and 3 ft/second will also clear any washed-down gravel and sand [Gayman] but this sort of accurate control was not available in the 17thC. Rainfall plus gravity was all they had, and rain did not fall in a steady stream at 3' per second. Heavy rain blocked the drains. No rain meant no drainage. Smelly, then, whatever the weather. We have all recently seen how too much rain can result in flooded fields, streets and houses, and it is always a surprise to see just how powerful water can be - carrying away cars, or whole buildings. The river Swale in Yorkshire is supposed to be the fastest river in England, and in the 1870s and 1880s caused so much damage that many families just gave up and moved to the Yorkshire and Lancashire mills. Many years ago a wise plumber told me "You can do anything with water except stop it". Open rivers simply overflow their banks, but when you put water in a tube you have to be confident that the tube is going to be big enough to cope with what we have learnt to call storm surges. Too much water will back up and burst to the surface, which can be very unpleasant. This 2006 photograph, showing work in St Paul, Minnesota, illustrates the size of the problem very nicely. In 17thC London, sometimes parts of the rivers were lined (early ones with wood), covered and culverted to form a closed sewer, with occasional access from grates in the streets above. As well as Marylebone Lane already mentioned, there was such a sewer 'close to the House wherein the Clerk to the Parliaments lives'. A sudden blockage of this sewer caused great concern - in the House of Lords at least - for the safely of the Parliamentary records [May 1664, House of Lords]. It must have been one of the culverted branches of the Tyburn river, and when in 1690 it became blocked again the backup once more caused great alarm to their Lordships. To the east, the River Fleet was a notorious and noxious open sewer, as pictured later in this essay. As early as 1290 a Carmelite prior in Whitefriars complained that the smell overpowered the incense and, when the Fleet Ditch was widened in 1756, Roman coins were found at a depth of 15'. I suspect that this was not a depth of water, but a depth of sludge. Underneath streets close to the river, other man-made sewers discharged directly into the Thames. A tidal river like the Thames has the added complication, or benefit, of water being pushed upstream twice a day. This must have also pushed water into the sewers and probably created a syphon when the tide turned (think of standing on a beach and feeling the sand move under your feet when the tide goes out - but nastier). "these same to be verrie olde and craked houses, and greatlie decaied by reason of a common sewer which comyth from the Thames by Kinges Strete, and from thence to and by St. James Parke wall, which sondrie covetous personnes having grounde of the same common sewer to enlarge themselves have so straightened and encroched the same common sewer as therebye moveth the water to swell so highe that all the said premisses be for the moste surrounded at many Springe Tydes, which hath decaied greatly verrie moche the grownde sylles of all the houses of the premisses." 'The client was Thomas Morton, a laceman, who had lived there since 1673. For the rebuilding of his premises he employed Benjamin Stallwood, bricklayer, and William Jackson, joiner, with whom he concluded an agreement in June 1690. Before building, they were to set the house-drain deeper, 'whereby the said Dreyne (if possible) might be inoffensive'. Sounds like a cesspit to me. If you were lucky you had enough space to build what they called a 'necessary house' out the back, which made it easier to empty. Sometimes the underground pit was arranged so that when full it overflowed through a crude culvert into the street [Gayman]. For Samuel Pepys (1650s), servants carried its contents up through his house but not always before next door's had fallen through into his cellar; Mayhew (1850s) said cesspits were emptied every two years. [Eveleigh]. The smell of sewage from the houses and horse dung from the roads and dead meat from the butchers and tanneries and tallow-chandlers must have been appalling. In 1722 John Hassell, a property owner in Tottenham Court Road, applied to the Commissioners to enlarge a sewer in front of his and his tenants' houses because the sewer was too small. In 1732 he again complained that the sewer was choked and that the rainwater overflowed the kitchens and cellars of their houses. By 1758 the new sewer was being described as Mr Hassell's sewer, and was being extended again, as house-building expanded. Later in the 18thC, it seems that some houses were being connected directly to sewers, since they are mentioned specifically; for example, the College Street Sewer 'received Water' from many places including 'Dean street, some Houses in King-street ... two Houses in the Bowling-alley, all College-street' [Kennedy]. All of these drains and sewers were ostensibly to remove rain and household 'grey' water to the Thames and thereby prevent flooding. There seems to be a conspiracy to suggest that an occasional dead cat or tannery waste might accidentally fall in but somehow human waste was never included, and that its removal by bucket or cart, to enliven the countryside and fertilise the fields (a profitable market for the night-soil men), was an adequate and successful process, followed by all, for centuries. I find this hard to believe, but it seems to be so. Yet in the 18thC newspapers, the only mentions of cholera are in advertisements for how to treat it when abroad. Until the 5th September 1797, that is, when the Whitehall Evening Post mentions cholera as 'in general not appearing till the end of August or early September'. The steady growth in urban population, causing overcrowding and an inadequate water supply, seems to have tipped the balance. The next sixty years would be very grim. 'where the basement story of the house is tenanted, the cesspool lies - perhaps merely boarded over - close beneath the feet of a family of human beings, whom it surrounds uninterruptedly, whether they wake or sleep, with its fetid pollution and poison.' [Jackson]. In 1854 London recorded 10,000 deaths from cholera, caused by foul water [Thomas & Ford]. I am actually rather pleased that my essay finishes in the 1730s, because from the background reading I have done recently [esp Eveleigh] it seems that although cities in the 18th-19thC entertained some very ingenious disposal schemes, health got much worse over the next 100 years. Then what became known as the water-carriage system gradually became the standard, flushing lavatories had somewhere to flush to, and combined sewer systems carried everything away. It still took another hundred years for the majority of houses to be connected, and not only in Britain. I went on a school French exchange in 1957, and the urban house of my penfriend's family had an earth closet in the garden. I remember it clearly. The bulk of household and industrial rubbish was carried away and dumped. Not always in landfill - sometimes it was more like land-hill. In the early 18thC Mount Pleasant was a series of pleasant fields just north of the City. A certain Christopher Hall kept his cows there (see the cowkeeper's essay). But by the middle of the 18thC this huge rubbish tip had accumulated. This picture shows the heap (and the River Fleet to its right) at Mount Pleasant, Cold Bath Fields, Clerkenwell; you can just see St Paul's on the distant skyline. In 1794 the rubbish heap was cleared and the Cold Bath Fields Prison built on the site. In 1889 the old prison became the Post Office's new sorting office - re-named as Mount Pleasant - because it was close to three main railway terminals. The city was growing, and its rubbish was piling up too. The main purpose of the 1671 Act was to create new and official dumping grounds. Six monarchs - all residents of London - would be amongst the beneficiaries of the 1671 Act introduced by the City Council. After the Restoration of the monarchy, Charles II was king, briefly followed by his brother James II then James' daughter Mary and her husband, the invited William of Orange. When William died, James' second daughter, the last of the Stuarts, became Queen Anne. The Hanovers started with George I (great-grandson of James I), then his son George II. All of these monarchs would have been very aware of the smell - George II looks quite nauseous. But the increasing number of other residents and butchers and fishmongers and dead dogs meant that it was not going to go away by itself. 'the making of two new Sewers and enlarging and amending the old Sewers near Charing Crosse for conveying the water away from annoying His Majesties Pallace at Whitehall'. Nobody seems to have taken much notice of these earlier regulations - perhaps because, with few newspapers, there was no easy means of telling everyone what they should be doing. Maybe the London Commissioners thought the fire would have concentrated the population's mind, and that it was worth having another go. The new tips (laystalls) were at Mile End Green, Dowgate Dock, Puddle Dock and White Friars Dock. Each laystall was allocated to a group of parishes, [details in Para XXXIII of the Act] and their present owners would be paid out of the fund established by Charles II for rebuilding public and civic amenities, including churches after the Fire. Charles didn't use his own money, of course, he introduced a coal tax to pay for it. The tax was not repealed for two hundred years! By 1709 the consumption of coal in London was such that a tax of 3s. per chaldron yielded more than £50,000. The original tax was 2s. per chaldron of coal. A chaldron was 32 bushels [Wikipedia]. Bushels measure volume rather than weight and one bushel = 1 ¼ cu ft. One cubic foot of average-quality coal = 60 lbs, so a bushel of coal weighs 75 lbs, which is about the weight of a ten-year-old child. Since kitchen maids probably weighed 75 lbs and did most of the carrying, the size of a coal scuttle would be suited to what she could carry, and since she would certainly be able to carry a toddler around, this coal scuttle probably holds about 10 kgs. The calculation, all from first principles, involved our wriggly granddaughter. John Noorthouck's New History of London, published in 1773 and reproduced in British History online, contains the wording of the Act itself, as an appendix of his book. 'As the inhabitants of this liberty are out of the city jurisdiction, as they refused to be included in the act for paving the parish of Shoreditch, and are too poor as a body to pave their own streets; we still see in Norton Falgate, between the improved streets of Bishopsgate and Shoreditch, a relic of the old inconvenient method of paving the metropolis: which at least serves by contrast to shew the superior elegance of the new plan.' Since one of the possible derivations for Shoreditch is sewer-ditch, the consequence of that decision must have been even more smelly. There had to be a way to keep clean and the solution was the patten, which lifted the wearers and their clothes out of the muck on the streets. Pattens had been around for hundreds of years. There is even a Worshipful Company of Pattenmakers. 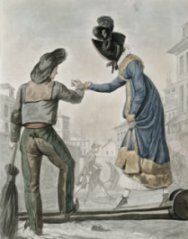 Wikipedia gives an interesting illustrated history which includes this teetering 1770s maid. The rules for the dustbin-men were clear and specific. The car-men, warning of their arrival by knocking a wooden clapper, would be responsible for 'sweeping and cleansing the streets, lanes and common passages from dung, soil, filth, and dirt'. They were then to carry the same, 'together with what shall be brought out of the houses of the inhabitants, unto the laystalls appointed by the commissioners', on Mondays, Wednesdays, Thursdays and Fridays, October to February, between 5am and 9am, and between 4am and 7am from February to October. On every Saturday, collections must start after 2pm and continue until the work was finished, 'or pay a forfeit for every offence [of] ten shillings'. Any unlicensed carter would have his cart impounded at the city's pound at the Green-Yard. There were to be separate fixed prices for industrial waste collection. There were restrictions on car-men numbers and each car-man had to display his licence number on his cart. There was a fine of 2s for speeding ('driving at a trot'). There were fines for spillage and fines for blocking a road with soil carts. Car-men would clear snow daily, if required, and after the thaw would carry away all the soil and filth found in the streets, 'upon pain of 10s for every day's omission'. Car-men and streetcleaners were expressly not allowed to sweep rubbish into drains or down the grates into the common sewers. The latrines - outside lavatories - provided for the comfort of local residents and tradesmen had their own specialist car-men. They seem to have been known as 'goung-fermers' because an obscurely-worded paragraph said that no ordure could be moved by the 'goung-fermer' until after 10pm in winter and 11pm in summer; the fine was 13s 4d. There was a fine of 40s for any widraughts, seat or seats for 'houses of easement' made over common sewers without licence (my italics). No on-line dictionary gives a clear definition of these old euphemisms although 'gong' was for centuries common slang for a latrine, fermer is French for 'close' or 'shut' and it's pretty clear what they were talking about. Shopkeepers and market traders may not hang out their wares to the hindrance of passersby or neighbours. Butchers and fishmongers may not dump dead animals or animal parts in the road. Drovers may not feed their animals in the open street. To keep streets safe, tylers and bricklayers must not throw broken tiles and bricks into the street but had to 'bring down the same in baskets or trays; upon pain to forfeit 3s 4d for every offence' and no-one was allowed to block the street when washing and drying barrels or hogsheads. Inn-keepers, Livery-stable-keepers, brewers, dyers, sugar-bakers, soap-makers would pay a quarterly fee to be calculated over and above the customary rates by the Scavenger's book, and for 12d per load, the car-men - 'and no other' - would collect additional rubbish, given one day's notice. The residents also had to abide by a set of rules, to make life more pleasant for all. They were expected to put out their 'dirt, ashes, and soil of their houses' in tubs or boxes before the car-men were due. Rubbish put out later would be the subject of a 5s fine. Absolutely nobody was allowed to throw out 'any soil, horse dung, or filth' either by night or by day; and fines for such actions by servants would be the responsibility of their master or mistress. If they had to make repairs, householders had to first get a licence then board off a space for the materials so as not to block the path. In the long term this and similar legislation did not result in moving the rubbish completely away. The consequence of early Victorian overcrowding is another gruesome story and one that I do not intend to visit. Charles Dickens' final novel Our Mutual Friend introduced the avaricious scavenger Mr Harmon and his wonderful dust-heaps, which he and his scabby workers sifted through for recyclable and saleable items. Today, 150 years later, we have our green re-cycling boxes. We are all scavengers now. The bibliography for Part 1 and Part 2 are at the end of the Pall Mall sewer story, which is here.